The idea of a new culture of 'welfare dependency' is the latest justification for attacks on welfare. Living on benefit supposedly destroys the desire to escape from poverty and find work, as claimants become accustomed to the state providing for them. Society can no longer afford to support such people. Many of those who accept these ideas say that those dependent on welfare are the enemy of 'the honest working people' who pay for benefits through taxation. 'Welfare dependency' is a common theme running through a number of recently published reports into poverty and the future of the welfare state. It appears increasingly in the speeches of Labour politicians. In 1994 the Commission on Social Justice published its findings as part of New Labour's campaign to ditch old policies. It has been followed this year by the Rowntree Inquiry into Income and Wealth (which is more cautious of talking about dependency), and Frank Field's Making Welfare Work. The Liberal Democrats have added Lord Dahrendorf's Report on Wealth Creation and Social Cohesion. None of these reports were commissioned by the government and they have all sought to establish a new consensus--indeed the Rowntree report featured both John Monks of the TUC and Howard Davies of the CBI on its panel. Yet the reports broadly agree on recommending private pensions and other ways of saving the state money on welfare spending. Frank Field, a Labour MP and chair of the House of Commons Social Security Select Committee, has written the most right wing of the welfare reports so far. Field used to be considered a maverick too right wing even for the right of the Labour Party. But since the publication of Making Welfare Work, influential Blairites have been suggesting that Field may go into an incoming Labour cabinet at a senior level.1 If New Labour is ideologically disarmed on welfare dependency, what prospect that a Blair government will resist calls from the right and business to implement new attacks on welfare? After all, the Labour governments of 1929 and 1974 both introduced welfare cuts. Those who talk about welfare dependency often use a strange kind of logic. They start from how miserable it is to be on the dole, or a single parent, or a pensioner dependent on welfare, and go on to blame the welfare system for the fact that people are forced onto it. Paying benefits somehow becomes a means of creating poverty. In addition, welfare dependency arguments are based on a number of false assumptions. Life expectancy in Britain today is roughly 73 for men and 79 for women.4 Though much of this increase is the result of improvements in medicine and healthcare, everyday factors such as conditions at work and at home, as well as diet, have played a surprisingly large part in allowing people to live longer. These everyday factors are linked to class. The poorest children in Britain are twice as likely to die from respiratory illness as children from the top social class.5 An adult man under 40 living in Glasgow's prosperous Bearsden6 today can expect to live nearly ten years longer than a man of the same age from Drumchapel (an adjacent area).7 Both areas are served by the same health service and the same general hospital. The growing number of pensioners is cited by all those who argue that 'the welfare system is in crisis'. As people live longer, the proportion of pensioners to people of working age rises, and so the spiralling costs of pensions and healthcare (old people are likely to need more medical treatment) are borne by the declining portion of people of working age. All the reports mentioned above discuss the problem of an ageing population, but none put figures on it. In fact the rise in the proportion of pensioners is easily exaggerated. There are currently four people of working age for every pensioner in Britain. By 2040 there will be roughly three for every pensioner a 25 percent fall. This demographic change is not simply to do with increased life expectancy, as is often implied, but is also a product of the falling birth rate. As the birth rate levels out, it is projected that after 2040 the ratio of pensioners to workers will stabilise and possibly fall. Due to a combination of unemployment and enforced early retirement (finding a job when you have been made redundant at 55 is almost impossible), one in four men of working age in Britain are economically inactive.14 In 1977, 8 percent of 55 to 64 year old men were out of employment. By 1994 this had risen to 59 percent15--given the high levels of poverty among pensioners, few have opted for this out of a taste for the good life. Insurance company representatives also told the Social Justice Commission that they are not prepared to offer any adequate schemes for insurance against unemployment. Levels of burglaries, fires and deaths can be roughly predicted and insurance premiums worked out accordingly. If private unemployment insurance existed, the 1991 recession would have wiped out any company that had set its premiums the year before.18 All such insurance schemes, whether for pensions or unemployment, face the same difficulty--the most vulnerable are the least able to pay. Two thirds of pensioners live on less than £80 a week, and half of these are living below the poverty line.19 These people have paid into the social security system all their lives, through national insurance, income tax and indirect taxes such as VAT. The problem they face is not welfare dependency, but low pensions. While pensioners are failed by the current welfare system, the vast majority would be even worse off under the private pension schemes proposed in order to save the ruling class money. Welfare dependency arguments imply that the option of a comfortable existence on benefits has created a growing class of people cut off from the majority who work for a living, leading to an increase in the welfare budget. In fact it is changes outside the welfare system that have forced millions onto benefits. Between 1961 and 1979, as Table 1 shows, real net income improved most for the poorest tenth of the population, and increased by broadly the same amount for the rest. From 1979 to 1991-1992, while the benefits system remained basically the same, the changes in real net income were negative for the bottom tenth and above average only for the top 30 percent. The Rowntree report shows that inequality in Britain is greater now than at any point since the Second World War. A striking example is the massive increase in poverty in London. For much of the 1980s it was argued that a 'North-South divide' had created a prosperous South at the expense of former industrial areas in the North. A look at the 15 local authority districts with the highest unemployment in 1991 shows how misleading this picture is. The surprising fact is that 'over the last 20 years or so. Britain's welfare spending has been stable as a share of GDP... Even if benefit levels kept up with overall living standards, the total net effects on public finances over the next 50 years would add up to an addition of about 5 percent of GDP--no more than the increase (mainly due to the recession) over the past three years'.21 In other words, welfare spending is primarily affected not by dependency or demographic factors but by the state of the economy. Social Security spending was higher in 1931, when the welfare state was very patchy, than in 1961 (as a share of GDP).22 Rather than a 'demographic time bomb' we have increasing poverty caused by capitalist crisis. Within the welfare budget, one of the areas which has grown most under the Tories is spending on Housing Benefit. Government spending on housing has increased massively at the same time as the quality of housing has generally declined and rents have risen above the rate of inflation. The people who have benefited from this policy are private landlords. Today there are nearly half a million homeless people in Britain, and over 1 million live in homes officially unfit for habitation. At the same time, 800,000 homes lie empty,23 and the government will not allow local councils to use receipts from council house sales to build new council housing to replenish housing stocks. As a result of the sell off of council housing, and the lifting of rent controls on private landlords, housing benefit paid to tenants in the private sector has seen a colossal rise. 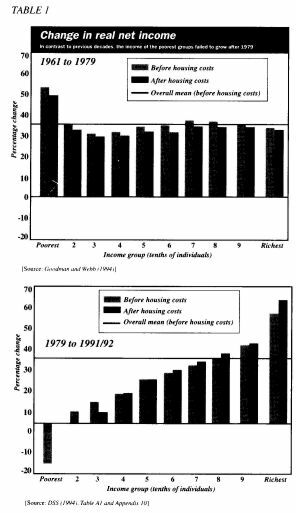 In 1976-1977, housing benefit paid to tenants in the private sector was just over £100 million at today's prices--less than one seventh of the total Housing Benefit budget. By 1993-1994, this figure was £3.8 billion, a 40-fold increase. Nearly half the Housing Benefit budget now goes straight into the pockets of private landlords and housing associations. The findings generated by such computer models show how little the welfare state actually redistributes, and demolish a central reform suggested by welfare dependency theorists. The main way the welfare state already works is like the 'savings bank over a lifetime' which they say would get rid of dependency. The main effect of creating a formal 'lifetime savings bank' would be massive administrative costs. There is a long tradition, stretching back to the Poor Law Guardians of the 1840s, of middle class bullies trying to use welfare to 'improve' the poor. But these words were written by Labour MP Frank Field for whom the problem with welfare is that it rewards 'immoral behaviour' and the goal of welfare reform should include a moral dimension. Field argues in favour of welfare insurance because it 'will free individuals from dependence upon the state and thereby improve their own sense of worth'.29 He describes welfare as a 'fundamental challenge... to a free, honest and open society',30 and argues that welfare makes people into criminals by encouraging them to cheat the dole. The obvious point is that it is not welfare in itself, but the poverty with which people surviving on welfare are faced, combined with the lack of decent jobs, that encourages them to claim as much as they can in benefits. The notion that this 'creates criminals' is as convincing as the idea that because I occasionally jaywalk I am on a slippery slope to armed robbery and a stretch in Wormwood Scrubs. The solutions proposed to do away with the 'dependency culture' are equally wide of the mark. Both Field and the Commission on Social Justice are keen on catchphrases such as, 'The welfare state must offer a hand-up rather than a handout'.31 It should be transformed 'from a safety net in times of trouble to a springboard for economic opportunity'.32 Income Support should 'act as a life raft taking people back into work rather than, as at present, as a sink into which they are dumped'33. But behind these seemingly innocuous soundbites, the actual proposals are more unpleasant. We are told, 'Every non-pensioner claimant would be expected to draw up their career plans',34 as if the reason for high unemployment is that people do not think hard enough about what kind of job they want. Field suggests claimants suspected of fraud should be made to sign on three or four times a day, turning them into professional signers on. He adds that 'identification cards would be a necessary accompaniment of this reform'.35 One argument against this proposal has come from an unexpected source. During a cabinet discussion on the introduction of ID cards, the Minister for Social Security, Peter Lilley, argued against their use. He informed ministers that only 5 percent of estimated fraud involves false identities, and that ID cards would not prevent all these cases. Though the Commission on Social Justice discusses education funding (another case where 'massive expansion cannot be funded as in the past by the state') none of the reports discuss the experience of student loans. There are obvious parallels between the introduction of student loans and replacing state pensions with compulsory contributions to private pension schemes. This omission can only be explained by the bad light thrown on some welfare reform proposals by the experience of student loans. A few years after the creation of the Student Loans Company the government was forced to nationalise it as private business lost faith in the potential to exploit an already impoverished section of the population. The company has since been plagued by corruption and inefficiency, while students face record poverty. John Westergaard argues that 'the people excluded from large participation in the 1980s growth of "average affluence" comprise no minority, let alone a clearly distinct one; but a good half of the population'.41 Sixty percent of 16-24 year olds who are unemployed find some sort of job within six months of starting to look for work.42 Rather than an underclass sponging off those in work, there is a very large layer of people, both in and out of work, who face poverty and need the welfare state. Labour's failure in office to defend the welfare state has opened the door to those who want to blame the crisis not on a lack of funding but on the system itself. Of course. in one sense, some people are dependent on benefits although the figure of 9.8 million Frank Field gives is misleading, since it includes 2.23 million people who get rebates on their council tax, and many others in work but on low pay. Many, single parents are trapped on benefit, not by the welfare system, but by, the absence of affordable childcare and the lack of decent jobs. Even capitalism's supporters do not see an end to mass unemployment and low wages. Short of a new expansion in the system which provides jobs and rising living standards, all they offer is to make living on welfare so unbearable that even more people are forced off benefits and into conditions which were common in the last century before the creation of the welfare state. While we fight to make sure such plans never become reality, we have to get rid of the system which has brought us to this point. 1 A Marr in the Independent. 20 June 1995. 2 A Rogers, 'Back to the Workhouse? ', International Socialism 59, Summer 1993, p8. 3 F Field, Making Welfare Work (Institute of Community Studies, 1995), p29. 5 Social Justice: Strategies for National Renewal (London, 1994), p43 [hereafter CSJ]. 6 Bearsden is the local authority area ranked third in Britain by the proportion of households from social classes 1 and 2: from Inquiry into Income and Wealth [hereafter Rowntree], (Joseph Rowntree Foundation, 1995), vol2, p82. 7 BBC Panorama, 13 February 1995. 8 J Hills, The Future of Welfare (Joseph Rountree Foundation, 1993), p12. 11 Guardian, 14 August, 1995. 12 Hills, op cit, p42. 13 W Hutton, The State We're In (London, 1995), p 16. 15 CSJ, op cit, p284. 16 W Hutton, op cit, p201. 17 Hills, op cit, p29. 18 CSJ, op cit, p230. 20 Rowntree, op cit, vol1 p 19. 21 Hills, op cit, p4. 23 CSJ, op cit, p11. 24 Socialist Worker, 27 May 1995. 25 Hills, op cit p19. 26 Socialist Worker, 27 May 1995. 27 William Beveridge versus Robin Hood: Social Security and Redistribution over the Lifecycle (LSE Welfare State Programme, 1993), p46. 28 F Field, op cit, p21. 31 CSJ, op cit, p224. 33 F Field, op cit, p5. 36 Hardship Britain (Child Poverty Action Group, 1992), p9. 37 Hills, op cit, p34. 38 Rowntree, op cit, vol1, p24. 39 W Hutton, op cit, p205. 41 J Westergaard, Who Gets What?--The Hardening of Class Inequality in the Late Twentieth Century (Oxford. 1995). p149. 42 Socialist Worker, 27 May 1995. 43 P Townsend, Hard Times: The Prospects for European Social Policy (Eleanor Rathbone Memorial Lecture), reprinted in P Townsend, The International Analysis of Poverty, (London, 1993), p238. 44 Rogers, op cit, p17. 45 Financial Times, 19 August 1995. 46 Independent, 15 August 1995.